Just less than a week ago an interview was held to talk about the journey Makanmaniacs.com has been through. This is the scanned copy i obtained from newspaper today (01.06.2009). 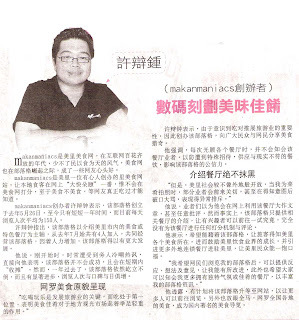 I would like to take this opportunity to show my greatest appreciation to Edmund Liaw (reporter) and his team from Sin Chiew Daily News in making such a great effort in getting this interview a successful one. Congrats on ur nice works. Thumb up! Hey pink where have u been! Congratulation! Pround of you! Don't give up! Thanks for your support, LB!